» Sign wavers: Will machines take over? Sign wavers: Will machines take over? With too much time on my hands, I scanned the revised Albany sign code that city officials and their consultants have been laboring for months to produce. Hard as I looked, I could find no mention of the latest in business promotions: robot sign wavers like the one above. Ten or 15 years ago, if memory serves, At Home Furniture on Ninth Avenue S.E. became the first Albany business to employ sign wavers — human beings employed to stand on the curb and twirl signs to catch the attention of people driving by. You can still see them in various places along the main drags. But now, it appears, humans are beginning to be replaced in even that form of work. 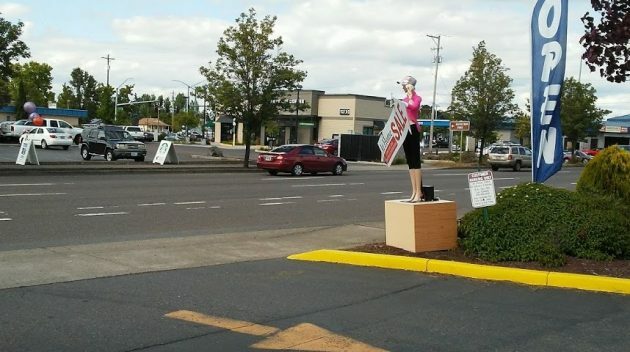 On Amazon and eBay, and probably elsewhere online, you can find deals on mannequins to wave your signs. “Without all the headaches of a sign spinner,” one ad claims. New, these things apparently cost around $2,800. But on eBay Friday, you could get a couple of used ones for about $600 each. On Friday, driving down Ninth Avenue, I have to admit that the blonde waving a sale sign outside At Home furniture caught my eye, for a split second at least, until I realized it was a doll. What comes to mind, right after the loss of jobs for people who haven’t found anything else, is how this squares with the campaign against distracted driving. But back to the changes in Albany’s sign code. The planning commission and city council have had meetings about it. On June 4 the planning commission held a public hearing. The council will hold one on June 27 and will then adopt this new section of the city’s development code. The changes are intended to make the regulations neutral in regard to what signs say, in line with the First Amendment and a recent court decision. The city will still regulate the bejeebus out of signs — how big they can be, where they can be put, how long they can stay, and so forth. But as for content, the city won’t care. So what about the old-fashioned sign wavers? They might be considered demonstrators with a message, which makes them not at all like a sign. There she is, trying to catch the attention of drivers on Ninth Avenue S.E. on Friday afternoon. In a free society that respects private-property ownership sign issues can be resolved without imposing the coercive power of government. This is happening every day, even in Albany. Neighbors and neighborhoods voluntarily come together all the time to decide allowable uses of private property. Government aggression is never the answer. Given the level of crassness many businesses demonstrate (see absurd TV commercials for locally-owned companies) Shadle’s “government aggression” is required to rein-in ridiculousness. Unlike a TV commercial, or an on-line absurdity, where you can turn the channel or click to a different website, the choice of one’s route between Points A & B are limited. Thus, vehicle operators are essentially forced to witness the idiotic sign-wavers, distracting drivers with absurd advertising. So, yes, Mr. Shadle, occasionally “government aggression” is necessary to preserve a semblance of safety. The day that we must surrender to the whims of business is the day freedom dies. I’d send you my address if I thought you would give me part, at least, of your Social Security benefits, since you are for anarchy and completely against government. The next step for the City Council to determine will be how much to tax the robotic signs, and, believe me, it will undoubtedly be happening soon. You know how it works, if it moves, tax it. I have an autistic son for whom waiving a sign is about all he’s capable of, with assistance. I find it unconscionable that, not only is it difficult for his caregivers to find him such work, such workers are being replaced by ugly spectacles of commercial greed. This is exactly how Skynet started. Yes they are ….until robots get rights. Yes, totally. The better a city is able to rid itself of all but the most discreet signage, the more desirable a place to live and do business it becomes. Triple that for signs that move or flash or blink. Otherwise, the only winners are the billboard companies and the purveyors of junk like this sign.